How about bringing fashion into every day casual wear? Marino Avenue has planned ahead and done that for you! With our large variety of colors, the Marino Avenue Suede Shoes bring casual to the next level. The TPR rubber, camel colored sole provides a cool look to our solid suede shoes and bring class into every day wear. With a sleek and classy fit, you're bound to steal the show! The Marino Avenue Suede shoes fit perfectly sleek and looks amazing on practically any size. No more loose backs and wide sides. Comes in half sizes for a better fit. Meet the Marino Avenue Suede Shoe and experience perfect comfort in an everyday shoe. Leave sacrificing comfort for beauty for the past. Marino Avenue ensures you look like a proper gentleman while your feet celebrate with thanks. Marino Avenue provides only the best once again. 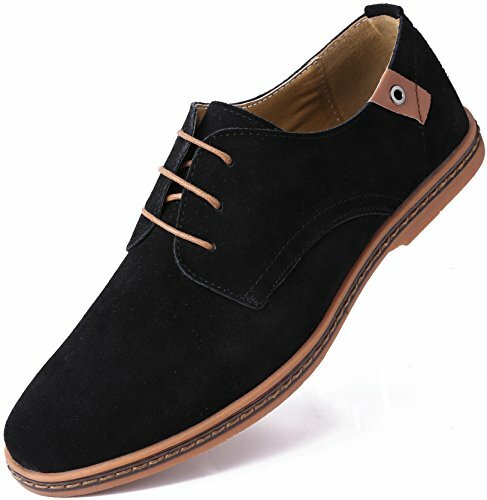 Made of the finest top quality Suede leather, The Marino Avenue Shoes won't tear or scuff up on you. The strong TPR rubber sole wont scrape off the bottom and prevents embarrassing slips while you're out. FASHION - Sport the look of ultimate fashion with the Marino Avenue Suede Shoe. Designed by top designers to create the perfect blend of style for a modern and casual shoe. COMFORT - You'll be amazed at the comfort Marino Avenue provides in a shoe. Made with materials to keep your comfort levels at the highest possible peaks, these shoes will become your favorite in no time at all! SUEDE LEATHER - Made with a fine suede leather to ensure Marino quality, Marino Avenue Suede Shoes are the perfect pair for everyday casual wear. Soles are made with a stylish camel colored TPR rubber sole to last long and provides a cool look to the shoe. With a large variety of colors to choose from, all you'll have to do is make up your mind! ORDER WITH GRACE - 100% satisfaction guaranteed, 45 days free exchange and returns, plus 180 days warranty. Our mission is to have our customers extremely gratified with the product they purchased, so if you haven't so, please take advantage of our swift exchange and return policy.